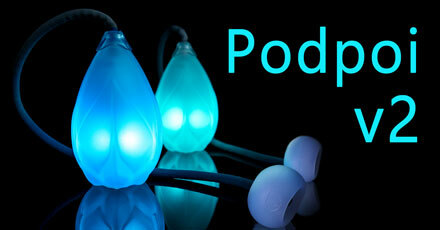 The NEW Podpoi v2 are out. This is a huge upgrade to the most popular LED poi in the world. These poi have a Micro-USB rechargeable battery, and come with two Micro-USB cables so that you can charge both poi at once. Most modes can run for over 12 hours before draining the battery, and they take 2-3 hours to recharge. These poi shells are made of a soft, absorbent silicone. This protects the electronics inside, and keeps the poi from hurting you upon impact. The teardrop shape keeps the mass in the base, making them very easy to control without being too heavy.